You wouldn't think it from her sweetheart demeanor, but our little Tassie is one hellaciously competitive athlete. This morning she ran her 3rd consecutive Umstead Coalition 4 mile race. 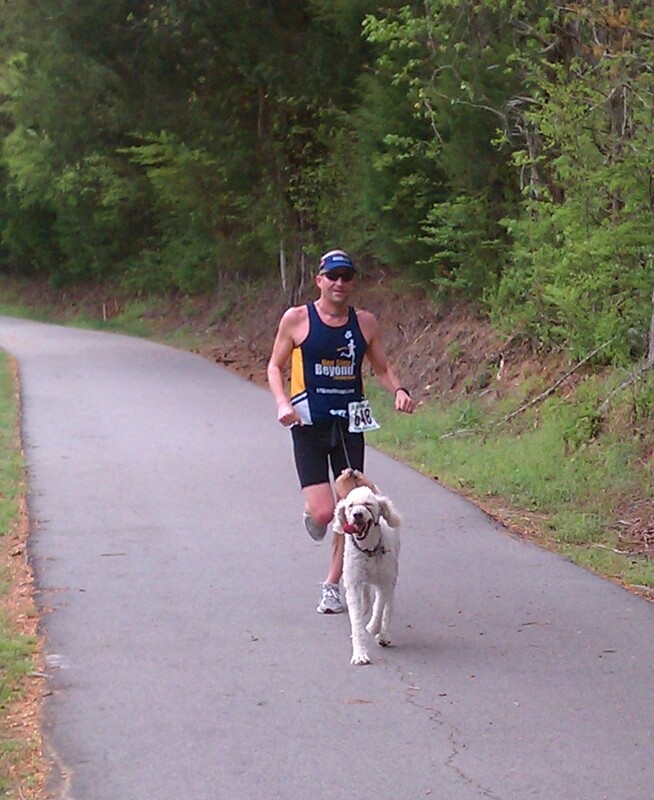 It is one of a handful around here that allows you to run with your dog. Tassie and I ran together in 2009; Tassie and Bri ran in 2010. This was our return year. The bar was set at 28:52 last season with a strong sub-7 final mile. Tassie had a better pacer. This year we took it out a bit too fast - 6:22 for the first mile. Tassie was fired up. We climbed the long hill at the 1.5 mile mark still feeling good, but the end of the hill put a hurting on our pace. 13:39 at the 2 mile turnaround. At this point we had a solid 8th or 9th place overall position and were well ahead of our main competitors, another guy and his fit looking dog. Tassie gave them a wiggle and kept running. Mile 3 was solid, we held 7:05 somewhat reluctantly. Mile 4 we got a bit lazy and complacent and ran in with a 7:40 or so to finish with 28:22. This is a 30 second PR but the pacing was atrocious. I have to take the blame for that. Tassie just wants to run. All was well, all smiles at the finish. How fun! I love running with my dog Molly. She tends to get overzealous and go out too hard at first too. LOL.